New Game Four Cast Was Presented By Slotland Online Casino. Where can you find a slot machine without levers? Where can you find a slot machine that uses a standard deck of cards (plus two jokers), but doesn't deal out the standard poker, blackjack or other recognizable card game? Where can you find a slot machine that can return over $120,000 to you on a $10 bet, WITHOUT hitting a progressive jackpot? 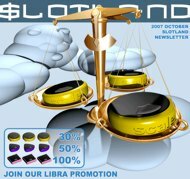 Of course, the only place where you will find such a unique game is at Slotland casino, the home of HUGE jackpots and unique slot machines! Slotland is proud to introduce Four Cast, the card prediction game that can yield a $122,880 win in just four turns of the card and a $10 bet! Just released in late September, Four Cast is already taking players on a fun, fast and enriching ride! In a nutshell, this card game requires you to flex your psychic muscles and forecast what card will appear next. You are given the option of determining the value of the next card (odd, even or high, which pays out 2 X your wager), the suit of the next card (Clubs, Diamonds, Hearts or Spades, which pays out 3X your wager) or BOTH the value and suit of the card (which pays out 8X your wager!). If you succeed in the first round, you can cash in your winnings or go for more by wagering your accumulated winnings in Round 2. Again, in Round 2, the payouts are the same (2X for correct card value, 3X for correct suit, or 8X for both value and suit), but your payoff will jump, as your accumulated winnings are now 2, 3 or 8 times larger than your starting bet. Once you successfully move into Round #3, payouts really start jumping! That is because, in addition to wagering your total accumulated winnings in Round 3, the payouts for each wager type increases by 50%. So if you are betting on value only, instead of a 2X payout, you will get a 3X payout! For correctly selecting the suit, your payout is 4.5X your wager, instead of the standard 3X payout. And if you test your psychic skills to the maximum and correctly guess BOTH value and suit, your 8 X payout becomes a 12X payout! Finally, Round 4 is where the big money lies waiting for you! At this point, a successful prediction DOUBLES your original payout rates! Yes, that's right; all payouts are increased 100%, now offering you a 4X payout for merely selecting the correct value, a 6X payout for the correct suit and an astounding 16X payout for accurately picking BOTH value and suit! It was mentioned that this game uses 52 cards and two jokers. In the game of Four Cast, jokers merely stop the game, but you DO NOT lose your accumulated winnings. So if you have made it to Round 4 and the joker appears, although it is indeed disappointing, instead of losing your accumulated winnings and walking away from the round with $0, you will be keeping the winnings you brought from Round 3 (which can be quite substantial)! 1st Round - You select HIGH and CLUBS with a $10 wager. The Ace of Clubs appears and you have now won $80 ($10 multiplied by 8)! 2nd Round - You select EVEN and SPADES, wagering your $80 winnings. The 4 of Spades appears and your winnings have now increased to $640 ($80 multiplied by 8). 3rd Round - You select EVEN and CLUBS, wagering your $640 winnings. The 8 of Clubs appears and your winnings have now increased to $7,680 ($640 multiplied by 12 - remember, in Round 3, your multipliers increase by 50%, making your payout 12 times your wager, instead of 8 times as in the previous rounds). 4th Round - You select HIGH and HEARTS, wagering your $7,680 winnings. The King of Hearts appears and your winnings have shot to $122,880 ($7,680 multiplied by 16 - in Round 4, your multipliers increase by 100%, making your payout 16 times your wager)! FINAL IMPORTANT NOTE: If, in the above example, you selected a different suit in each round, IN ADDITION to winning $122,880, you would ALSO win the progressive jackpot! Perhaps now you can see why FourCast is already making waves among new and veteran Slotland players alike! Why not jump in NOW and give your luck a good turn!